A man in his twenties this week walked his 11-year-old sister to her first day at secondary school. Along with millions of others that morning, he had to run the gauntlet of pavement parkers, rat runners and impatient motorists. If you’ve ever spoken to a driver about the standard of their motoring, you may be unsurprised by what happened next. The man remonstrated with one particular motorist over the the standard of his driving so near to the school. 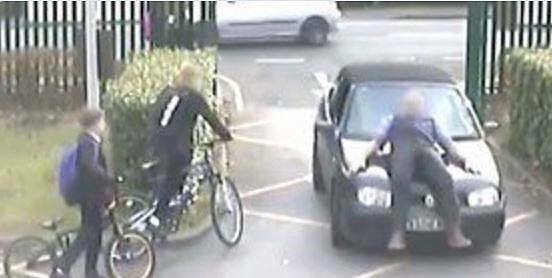 Minutes later, the same car returned, mounted the pavement and ran over the man and his sister – inflicting serious head injuries to the girl in the process – before driving away. Incidents like this happen far more frequently than most realise. For example, a parent who became angry at being prevented from driving into school grounds last year deliberately ran over a teacher – throwing him into the air. He was driving a car with not insurance or MOT and used his vehicle as weapon against the teacher with potentially lethal consequences. It was an act of terror that has been covered in very few newspapers. Perhaps the apathetic reaction is a result of increasing belligerence by drivers. There is a frontiers feel to our roads. Rather than prioritising provision for cars, we should place them last on the transport planning pecking order. One of our campaigns here at the ETA involves helping schools to get a safe crossing outside their gates. A few years ago we helped a school get a zebra crossing they were desperate for. The school had included the request for a crossing in their travel plans for many years, a child had been hit by a car and parents had called the local authority to plead for a safe crossing, but all to no avail – the local council maintained that the cost of the zebra crossing was too high. We built a pop-up zebra crossing from lino, drain pipes and two party balloons – the stunt got into the papers and prompted the local council to install a real zebra crossing. Unfortunately, drivers now stop and park on the zebra crossing, which defeats its purpose and, in all probability, makes it more dangerous for children than if there was no crossing there at all. The interesting, and frankly downright depressing, thing is that when we revisited the site to politely ask drivers why they were parked on the zebra crossing their reactions were always dismissive or defensive and occasionally aggressive. 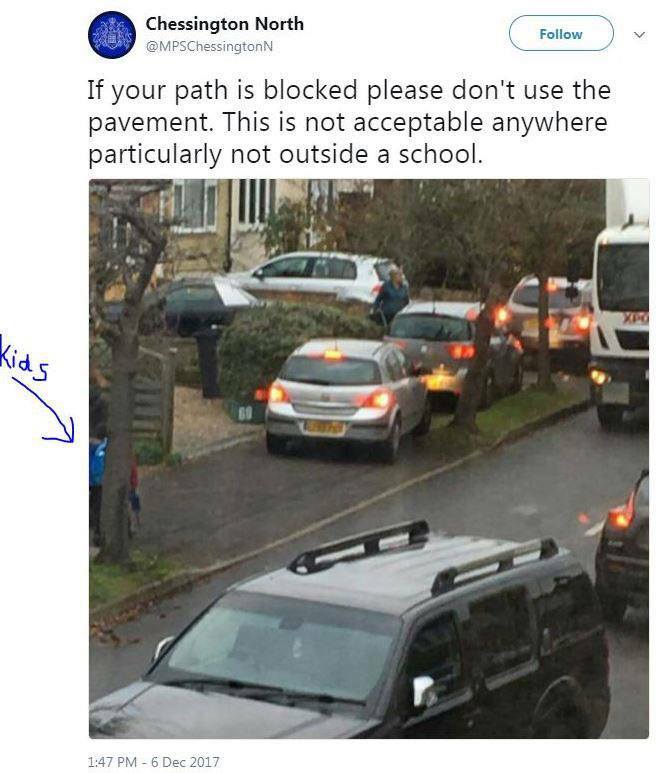 In this case, motorists who found the road blocked near a school, decided to use the pavement instead. Why do motorists feel so entitled? Well, in part because the culture of British roads has it that a cyclist or pedestrian wishing to avoid death or serious injury on the streets where they live, work or play, must defer to motorised traffic. Another reason highlighted on a blog by West Midlands police is that motorists do not fear being caught or punished. Should a driver not give a cyclist the time and space necessary or fail to see them completely they should expect to be prosecuted. In other words the carrot goes out the window and in comes the stick. Why some might ask? Well if drivers expect to be prosecuted for committing offences they suddenly stop committing them, unsurprising correlation I know but it’s the truth. Once drivers become aware that an infringement involving a cyclist is one they should expect to be prosecuted for, they suddenly become more aware of them on the road and in turn start giving them the time and space they should lawfully have as an equal road user. Cyclists suddenly occupy a drivers attention, they actively look out for them and so are less likely to miss them at junctions and contribute to our KSI statistics. So drivers need to expect a zero tolerance approach for any offence involving a vulnerable road user, or an offence that could contribute to a collision involving a vulnerable road user. The only way to change driver behaviour and concentrate minds on looking out for vulnerable road users and change driving habits is through enforcement, and the resulting fear of being prosecuted. Law enforcement to one side, where a systematic approach to road danger reduction has proved successful, it rests on a holistic approach based on far more than road policing. Road culture changes quickly when those in power consider every single road death as preventable: streets are designed with people in mind, speed limits are reduced, strict liability in law is introduced, legal frameworks are strengthened, roads policing is properly funded and active travel is invested in. Meanwhile, here in Britain, a wealthy driver lobby, a transport policy centred on encouraging car use through heavy subsidies, neglect of active travel and billions sunk into new roads that quickly fill with traffic all do their part towards making aggressive drivers feel untouchable. Little wonder road danger reduction in Britain is as politically toxic as gun control in America. Parking control in much of this country places great emphasis on minor money-related infringements in car parks while virtually ignoring dangerous offences committed on the road. If you park in a supermarket car park and stay beyond the time limit you might be a bit of a nuisance but you are endangering no-one. However your car will be picked up by cameras installed at the exit and you will receive a notice demanding a payment of around £100 with dark threats if you don’t stump up the money. The cash goes to private companies which are making millions out of motorists who are doing very little harm. Park in a local authority pay and display car park and overstay and you will probably be booked by a member of council staff on patrol – again there will be a demand for a hefty sum of money, even though you have not caused any danger, just occupied a space for longer than you paid for. Park on a pavement/yellow line/zig zag (or any combination of the three) and the chances are you will incur no penalty – this despite the fact that you may be causing a dangerous and possibly life-threatening obstruction, forcing pedestrians into the road, blocking the view of other motorists approaching a crossing and generally being a nuisance to all road users. Enforcement is split between local authorities and Police, and while there are, I understand, areas where the rules are more strictly applied, in general it seems reckless motorists are free to do as they please. It seems that it’s only money and commercial considerations which matter – life and limb are irrelevant. We need to move the emphasis away from purely financial infringements committed in car parks and concentrate on making our roads and pavements safe. I work with a local Community Speed Watch team & at a recent meeting with the North Wales Police and Crime Commissioner , he advised us that ‘Road Safety was not a priority ‘! Is it any wonder that motorists think that they can get away with anything? Just a comment on your ethical insurance. Your travel insurance is very ageist. Premiums climb very steeply purely on the basis of age, making no reference to record of claims or health ststus of customer.